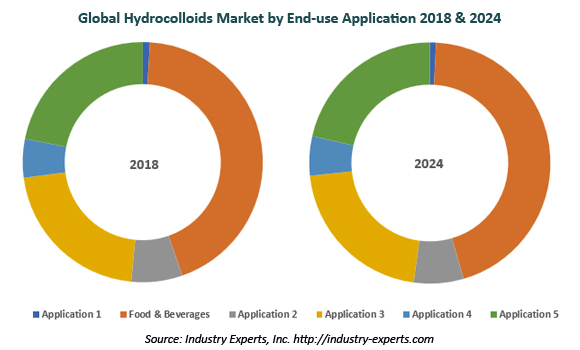 Owing to the Demand from F&B and Oil & Gas Sectors, Global Hydrocolloids Market to Witness 4.3% Growth through to 2024 and Reach 2.9 Million MTs – Market Report (2018-2024) by Industry Experts, Inc.
Industry Experts, Inc. published the global market research report “Global Hydrocolloids Market – Raw Materials, Products and Applications“. According to the new report, Cellulose-based based hydrocolloids is the largest market among all hydrocolloid raw materials which is estimated at 795k metric tons in 2018 while Seaweed-derived hydrocolloids market is projected to witness the fastest growth during the analysis period 2018-2024. Hydrocolloids constitute a diverse group of long chain polymers, which interact with water to form colloid systems of solubilized particles either in the form of gel or a liquid system. Both technologically and economically, hydrocolloid polysaccharides have major importance and are used in the food, pharmaceutical, medical, cosmetics, personal care, oil drilling and other industrial sectors due to their distinct physical and chemical properties. Commercially available hydrocolloids on the market today are extracted from plant, microbial, animal, cellulose and seaweed sources. This global market report analyzes hydrocolloids by raw material source comprising Animal-derived, Microbial-fermented, Plant-derived, Seaweed-derived and Cellulose-based. The report analyzes the global market for hydrocolloids by individual hydrocolloids types consisting of Gelatin, Xanthan Gum, Gellan Gum, Guar Gum, Gum Arabic, Locust Bean Gum (LBG), Tara Gum, Pectin, Agar-Agar, Alginates, Carrageenan, Carboxymethyl Cellulose (CMC), Methyl Cellulose & Hydroxypropylmethyl Cellulose (MC & HPMC), and Microcrystalline Cellulose (MCC). The study also analyzes the key end-use applications of hydrocolloids including Animal Feed, Food & Beverages, Pharmaceuticals & Healthcare, Cosmetics & Personal Care, Oil & Gas and Industrial/Technical applications. The global markets for the above-mentioned hydrocolloids raw material sources, types and end-use applications are analyzed in terms of volume in metric tons and value in USD. The report reviews, analyses and projects the Hydrocolloids market for global and the regional markets including the North America, Europe, Asia-Pacific, South America and Rest of World for the period 2015-2024. These regional markets further analyzed for 21 independent countries across North America – United States, Canada and Mexico; Europe – France, Germany, Italy, Poland, Russia, Spain and the United Kingdom; Asia-Pacific – China, India, Indonesia, Japan, South Korea, Malaysia and Thailand; South America – Brazil and Argentina; and Rest of World – South Africa and Turkey. This 662 page global hydrocolloids market report includes 363 charts (includes a data table and graphical representation for each table), supported with a meaningful and easy to understand graphical presentation, of the market. This report profiles 51 key global players and 245 major players across the North America – 26; Europe – 50; Asia-Pacific – 139; South America – 16; and Rest of World – 14. The report also provides the listing of the companies engaged in research & development, manufacturing and supply of hydrocolloids. The global list of companies covers addresses, contact numbers and the website addresses of 500 companies.